February’s Vintage Card of the Month turns out to be the epitome of a classic common card. 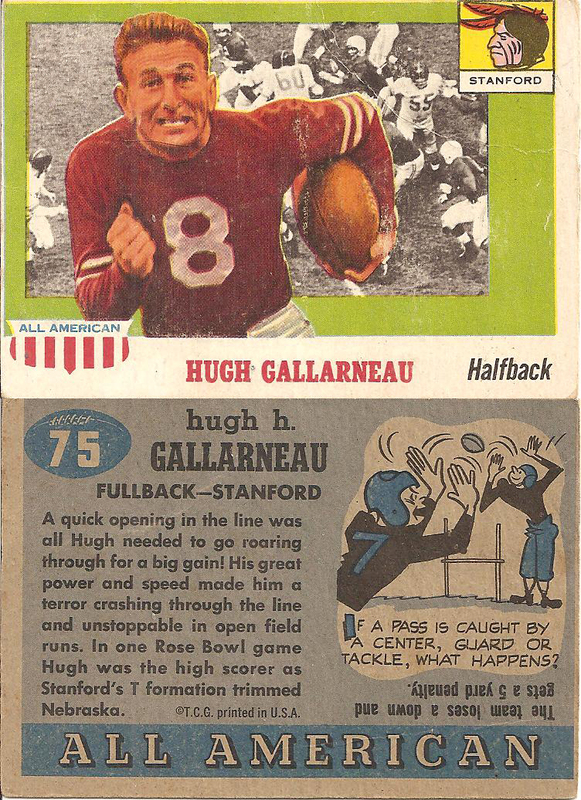 Hugh Gallarneau was actually such a significant force for the Stanford Indians (now Cardinal) that along with teammates Frankie Albert, Pete Kmetovic and Norm Standlee, turned the team from a perennial looser to an undefeated team in 1940 and ended the season ranked #2 in the country. But that success did not carry over in to his pro years. By the time the 1955 Topps All American set was release Gallarneau was done with football having gone on to have a mediocre career having played only 5 seasons for the Chicago Bears (interrupted by World War II) but he will best be remembered for his time as one of the WOW Boys at Stanford. As you can see Topps was having QC issues even back in 1955, I would call this at least a 95/5 on centering and there are a number of creases but I enjoy the card none-the-less. This is a piece of history, one of the best football sets of the Century in my opinion. 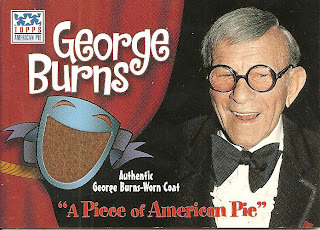 I actually picked up this card recently in a trade. I love the trivia added to the back of the cards. 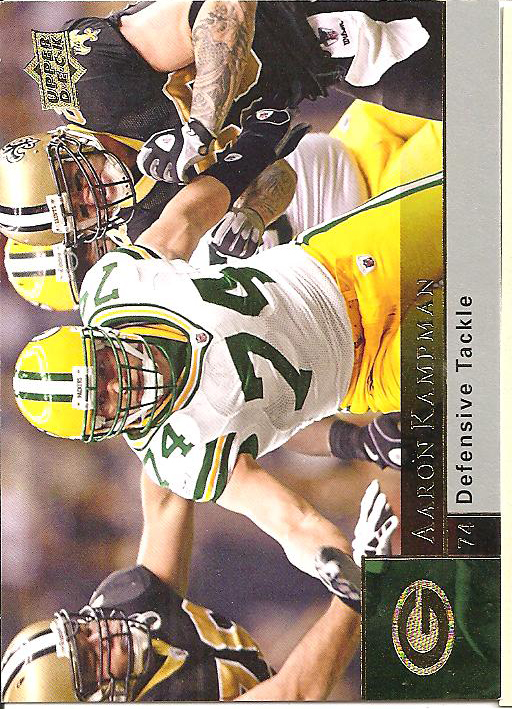 Did you know that in 1955 if a pass is caught by an Offensive Lineman the team is penalized a down and 5 yards. I had to look in to this one but the penalty now is either a loss of down (if the Defense refuses the penalty) or loss of 5 yards (if accepted). 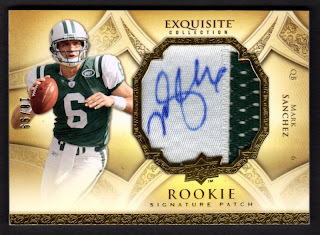 ﻿Gellman from Sports Cards Uncensored is running a contest with a box of Topps Five Star Football as the prize. 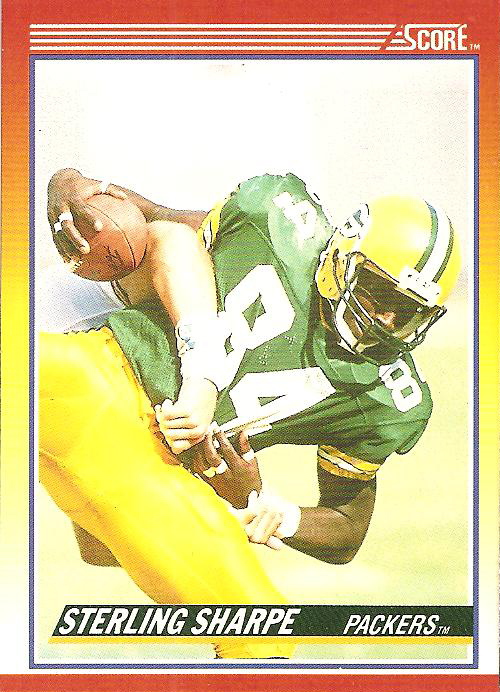 The question he asks is to tell about our favorite Topps football card. 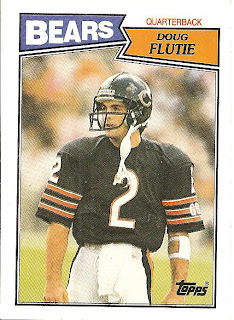 Without even thinking about it I can tell you that my favorite Topps football card above all is my 1987 Topps Doug Flutie, card #45. There are a number of reasons why this stands amongst my favorites; I have liked the guy since his USFL days, the 1987 Topps football set was the first set I ever completed, this card is Flutie’s RC and the main reason I like him is because he was the underdog. He was not supposed to be a star, he was not supposed to really even be playing professional football but he proved everyone wrong over a very long, 20 years, career. His determination and resourcefulness more than made up for his size. Leaf has made two recent announcements regarding their MMA wrapper redemption program. First, the Alistar Overeem redemption has been extended until February 28th. The second announcement regards the 3 offer which will be for Jon Jones, which will run through March 31st. The first offering (Offer #1) was a 2010 Leaf MMA Shogun Rua autograph #/85. This offer was valid through 1/31/11 or while supplies last and has since expired. I do not see any up for auction at this time but the last one I did see sold for $180. The second offering (Offer #2) is a 2010 Leaf MMA Alistair Overeem autograph #/185 and is still available for 96 wrappers. This offer was extended through 2/28/11 or while supplies last. 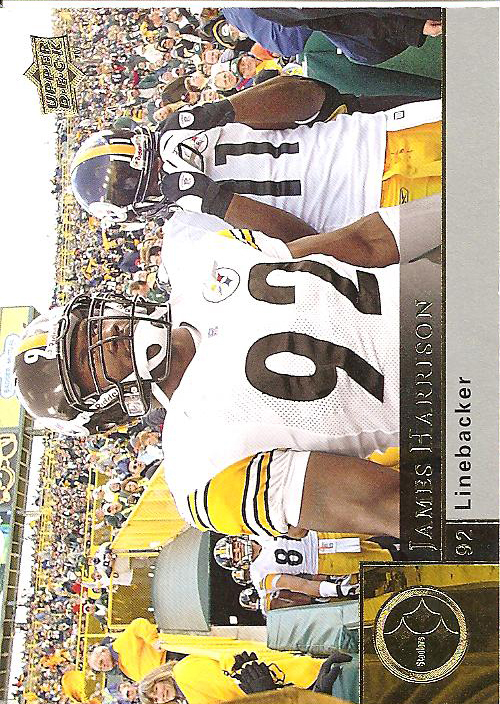 There are currently three of these cards up for auction, they are at $199, $199 and $220 and all are BIN auctions. 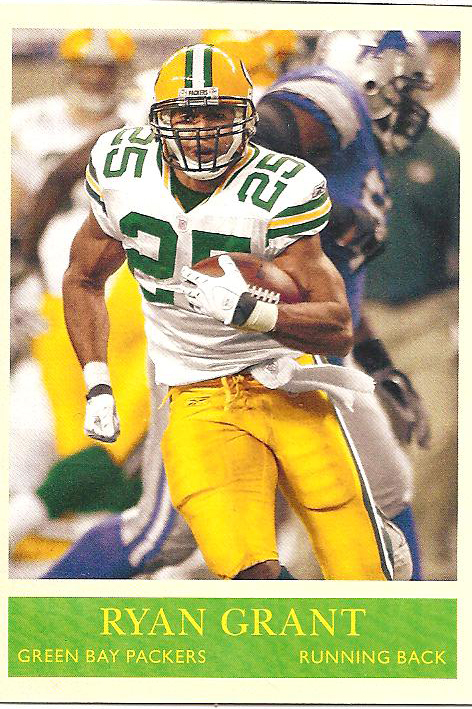 Panini has gold in the mind with the current Golden Ticket in 2010 Playoff Contender Football and not the 2010-11 Panini Gold Standard Basketball coming out in May. The crazy thing about this product is that Panini not only used gold as the theme, which you will notice the gold coloring to every card, but there will actually be gold encased in some of the cards. Each case will include 1 “Gold Rush” card plus there are 50 “Solid Gold” 14 Karat Panini 50th Anniversary Gold Cards #1/1 also available. There are some concerns, in a product like this you would think that stickers and manufactured patches would not be included but they do make an appearance. There are 12 cards in each pack, something not common in high end single pack boxes. 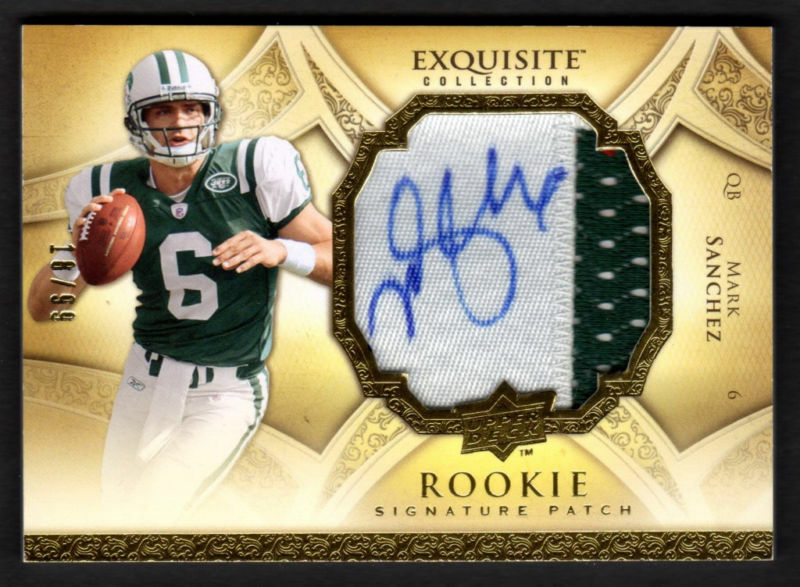 If I do not take the price in to consideration, which I have seen range from $185-200, I have to give this product a 3 ½ out of 5 because considering that this is a high end product you still have the chance to pull a sticker auto or manufactured patch. Sometimes while searching eBay you come across items that are being sold by someone who is either delusional or just plain trying to rip people off. Today while searching for Lou Gehrig and Babe Ruth cards I came this listing for a 2001 Upper Deck Legends of New York Babe Ruth card supposedly containing “a piece of game worn hat REAL!” but the card pictured (which you see above) is a base card from the set. 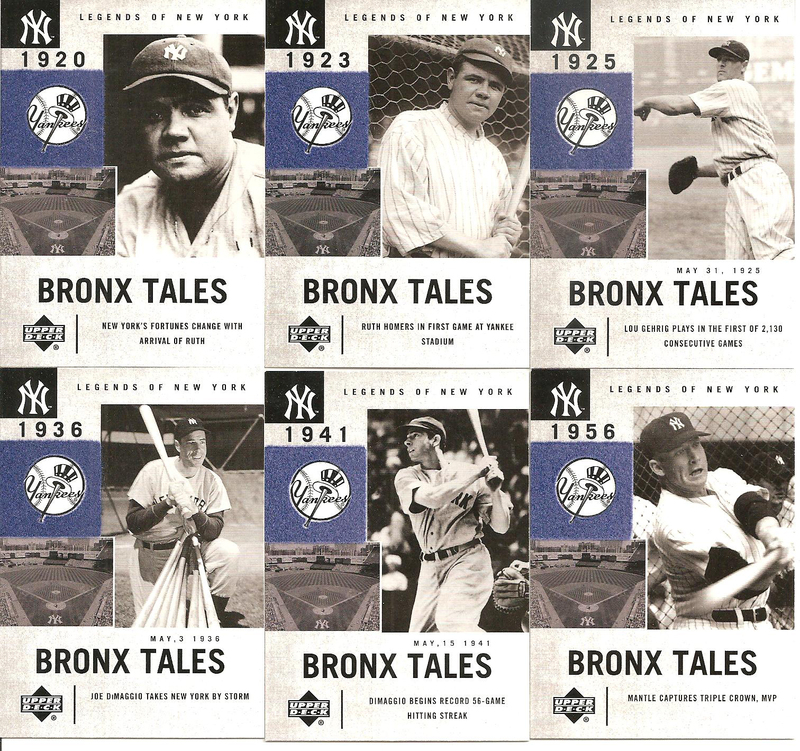 If you are not familiar with the 2001 Legends of New York release, Upper Deck created this set highlighting the teams of New York both past and present. 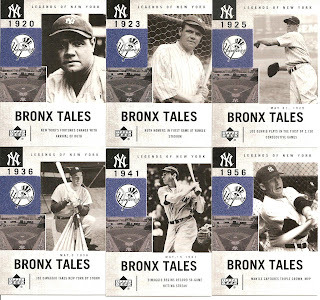 It includes the Yankees, Mets, Brooklyn Dodgers and New York Giants. On the front of the card the team’s logo is made up of felt using the team’s colors. His card is even in pretty bad shape with multiple creases across the front. 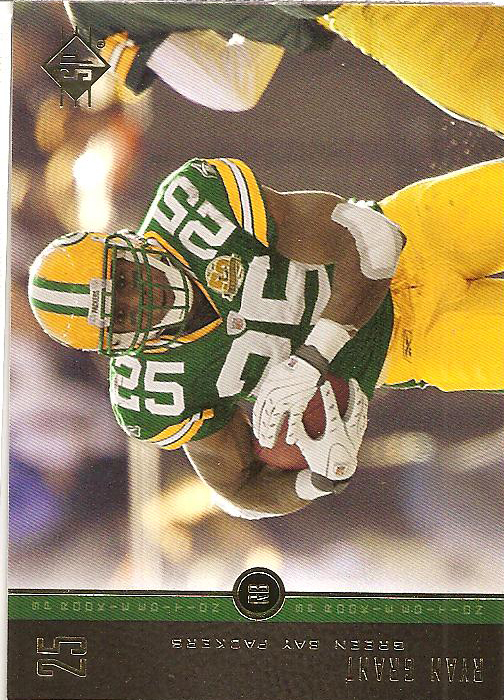 Most base cards from the set in mint condition sell for only a couple of bucks. What leads me to believe that this guy is attempting to rip someone off is his claim that the card came with a Certificate of Authorization, which he mistakingly threw out when he got the card. This is a lie because Upper Deck marked the back of these cards as authentic, not on a separate certificate. 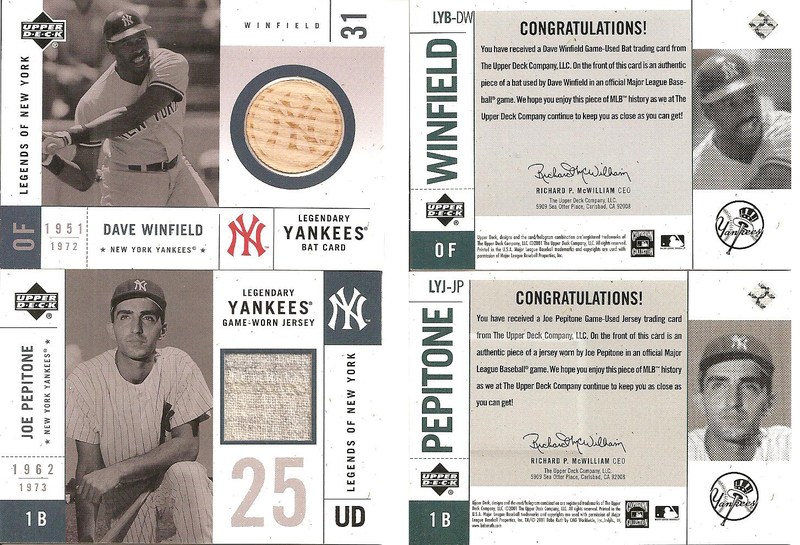 I opened a box of this product and was fortunate enough to get pretty close to an entire set plus I pulled a Dave Winfield bat card and a Joe Pepitone jersey card. As you can see the base cards look very different from the memorabilia cards and all of the base cards contain the same felt around the logo. 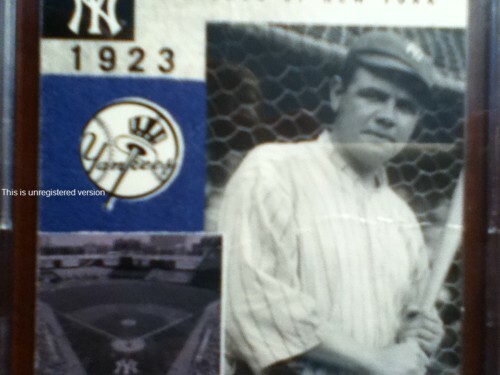 I even have the same exact Ruth card #126 along with other Yankees cards. On a separate note, you will see that the dates for Winfield are 1951-1972. Considering he was born in 1951 and he played for the Yankees from 1981-1990 I think this is just a mistake. 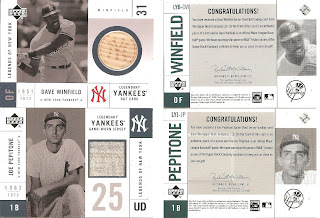 Pepitone’s dates are incorrect too, he played for the Yankees from 1962-1969. Now he did play for the Astros, Cubs and Braves between 1970-73 so I am not sure if the dates are his full career or if the dates are supposed to be their time with the Yankees. First and foremost is that if someone is to spend $400 on a pack of cards they better get on-card autographs not stickers. Panini really messed this one up. I know people will still drop this kind of cash on packs but I bet there will be a feeling of being cheated. Every autograph except the Souvenir Cuts (which are cut signatures) are stickers, which do not belong in a product like this. 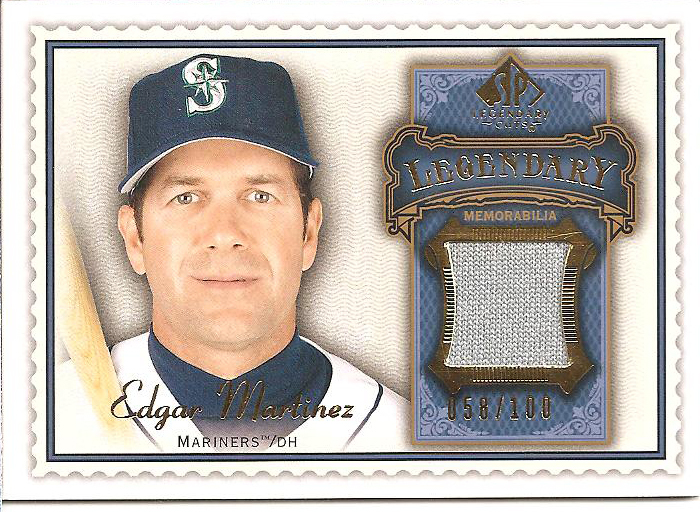 To make matters worse is that almost every memorabilia card was designed to add a sticker autograph including the Colossal patches, Timeline, Rookie patches, Notable Numbers, etc. The problem is that apparently they are not all going to include an autograph. I know the Timeline inserts for sure are not all autographed which leaves the card looking unfinished with too much negative space overpowering the design. To add to the pain of paying $400, know that you can pull hits of power players like ex-Jet Wayne Chrebet and Chargers third-string Running Back Darren Sproles (I know he is a decent Kick Returner but really?) If I am going to pay this price I want three types of players only- Stars, Hot Rookies and HOF players and that is it. I know that Ernie Davis is not in the Pro Football Hall of Fame but he is a very special exception. On the positive side there are some AMAZING cards in this set. The Dual Brand Logo patch cards are beautiful. 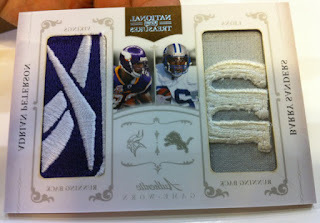 The Barry Sanders & Adrian Petersen card has been posted and you can see what I mean about being a very sweet card. The Rookie patch and logo cards also look great and I really like the Souvenir Cuts. Sticker… wait, did I mention that already? Not taking the price in to account this product is a solid 3 out of 5, this score is in part due to the sticker autographs and the cards designed with a sticker auto in mind but do not include the autograph. If this product was on-card autographs it would easily be a 4 out of 5. Albert Pujols has said that if a deal has not been agreed upon with the St Louis Cardinals by noon on Wednesday then there will be no discussion during the season and Pujols will then be a free agent following the upcoming season. He has made it clear that he wants to remain with the Cardinals and hopes to retire in St Louis but if things do not work out and he ends up going elsewhere does Pujols become more collectable? I figure that if he were to go to the Yankees, Red Sox or maybe even the Dodgers I would expect an increase in his prices because those teams have some pretty rapid fans/collectors, but what if he were to end up playing in Florida (either the Rays or Marlins) or how about in KC, Minnesota or Seattle? Let’s say he plays for another 10 years in a new city and let’s say he keeps up his production, do we still see people paying $100 or more for his autograph in a Mariners uniform? 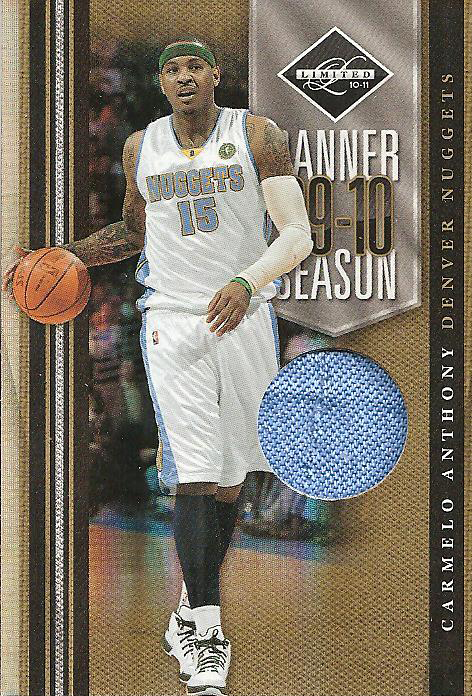 A couple of weeks back I got an email from Greg at Plaschke, Thy Sweater Is Argyle asking if a Russell Westbrook relic that I pulled from a 2010-11 Donruss Basketball blaster is available for trade. Being an anti-OKC Thunder person (Clay Bennett is a bad man who stole the Sonics) I was more than happy to part with the card. 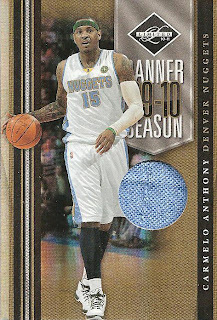 The trade was basically a Carmelo Anthony Banner Season jersey card for the Westbrook jersey card plus a couple of additional cards. I sadly admit that I do not trade enough, I think part of it deals with the fear of getting screwed over but I am finding that the blogging community is actually a great group of collectors. 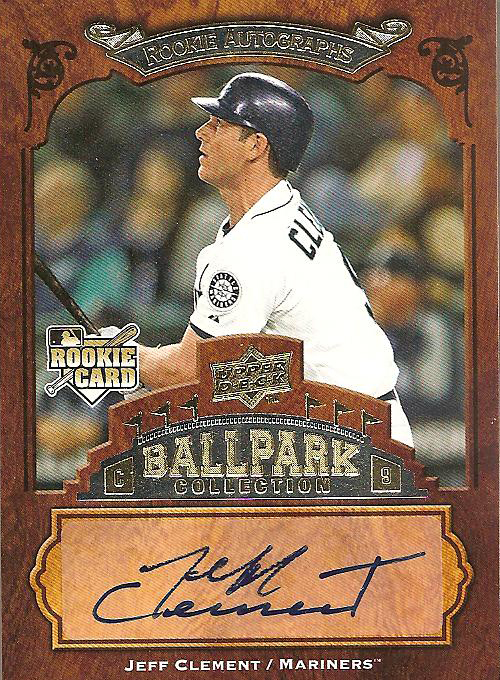 I remember when this guy was coming up; he was the First Baseman of the future. He was sitting behind a quickly failing Richie Sexson. Unfortunately he was never given a fair shake in Seattle and was included in a trade of mediocre players to the Pirates. 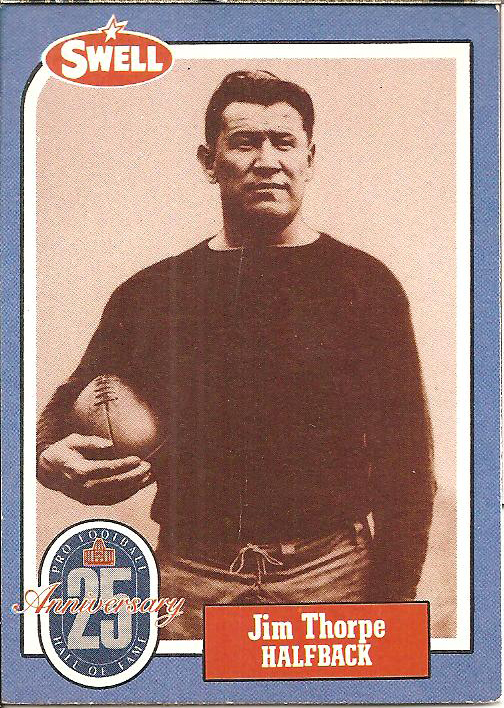 Jim Thorpe is a favorite of mine and I am always happy to add another card to my personal collection. Thorpe is one of the greatest professional athletes in the world ever. 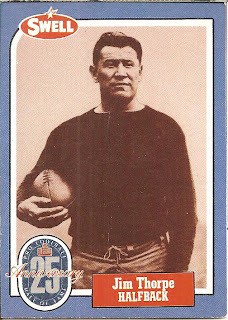 A gold medal Olympian, NFL Hall of Famer, he played 6 years in MLB (289 games) with a respectable .252 BA and a couple of years ago it was found out that he played professional basketball for two years in 1926-27 on a team he created, the World-Famous Indians, which barnstormed across the East Coast. Is It A Jets QB Thing? Does Mark Sanchez’s recent indiscretions with a 17 year old girl, yeah yeah… I understand that 17 is legal in NY/NJ but that does not make it right, change your opinion of him or how you collect? Yesterday Upper Deck released the 2010 Upper Deck World of Sports set. A 400 card checklist consisting of athletes from all walks of the sports world including baseball, basketball, golf, ice hockey, BMX and even coaches and today they added more value to the release when they announced that collectors can send in box tops from opened boxes of World of Sports for a chance to win a #/5 dual autograph card of Michael Jordan and Tiger Woods. The Lakers have been tossed in to the mixer regarding a possible trade for Carmelo Anthony. Right now the word is that it would basically be a Andrew Bynum for Carmelo Anthony trade but with everyone denying it this can be considered no more than just a rumor. With the score sitting at 21-10 at halftime I felt an eerie feeling that with a couple of field goals the random sports cards would have been correct. While I was happy with the end results I felt that overall it was a bad game. The Steelers played poorly in the first half and the Packers played poorly in the second half. It was not a situation where the better team won as much as it was where both teams played badly and the team that played a little less poorly won. Monday I was planning to cover the best of the rest where I went through the 16 packs again and pull the best of what was left. Sad to say there was not a whole lot of “best” cards left. 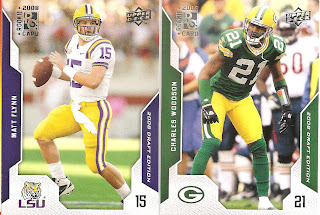 A couple of the cards that I would list as “Among the best” include the Bart Star and Vince Lombardi UD Masterpiece cards, a UD Icons Tom Brady NFL Icons #/450 and a couple of decent rookies like a UD SP Darren McFadden rookie. The best card though is this UD Icons Matt Ryan Silver die-cut RC #/150. While I may not have pulled any amazing hits I had fun opening the packs, well worth the cost of the re-pack box so the Ryan RC is just icing on the cake. 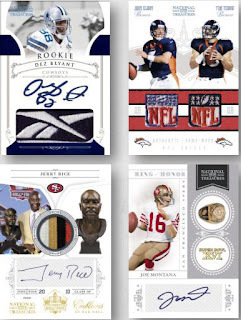 Can Sports Cards Determine The Super Bowl Winner? With just about an hour left before the Super Bowl everyone is trying to get their final predictions as to who will win the big game. Personally, even though I hate the Steelers I still think they will come out victorious. I see that Las Vegas does have the Packers as a 2 ½ point favorite with the Over/Under set at 45 total points scored. But as I was finishing up my last minute game day food shopping I noticed a stack of re-pack boxes sitting with the other impulse items on the shelf. There was a stack of baseball and a stack of football boxes and what caught my eye was the “Championship Collection” logo on the box. Was this a sign? Can we rely on the fortune telling of 16 random packs of football cards to pick the winner of the Super Bowl? Why not, sounds as logical as some of the other ways that people pick a winner. 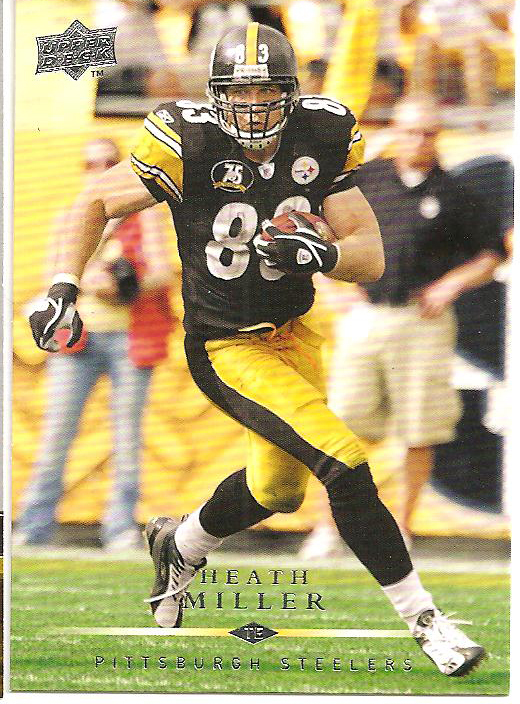 So with 16 packs of football cards ranging from 1990 through 2009 I figured I would try to come up with a guess as to who will win and what the final score will be based on what Packer and Steelers cards I end up pulling. 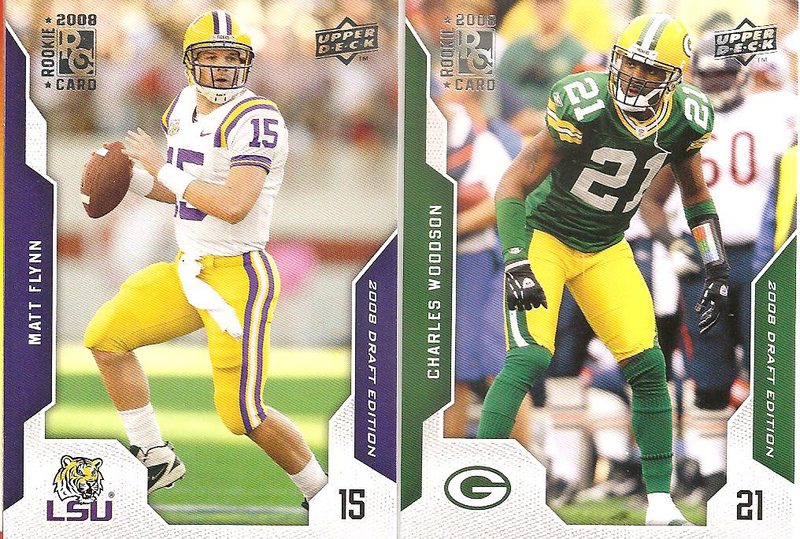 TD w/ 2pt Conversion (8 pts)- For any autos or relics (NFC hits go to Packers, AFC hits go to Steelers). You read that right, the Green Bay Packers are going to overcome an early deficit to beat the Pittsburgh Steelers. Random Question... Help Me Please!!! I am just wondering what superstitions people have when it comes to picking and opening boxes and packs. Throughout the years I have tried one thing or the other but nothing seems to really work for me and I am hoping to come up with something that will help me shake my current funk. 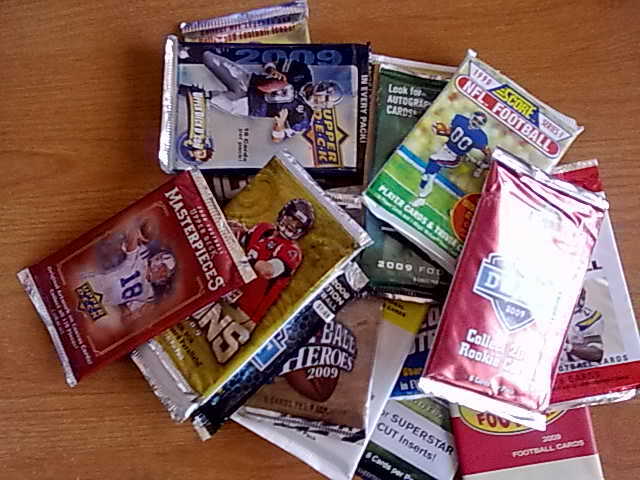 I am tired of busting boxes loaded with Limas Sweed and Mardy Gilyard jersey relics. So tell me, what do you find that works? Sometimes I will have a subject just rattle around in my head for a few days and I can not get it out. 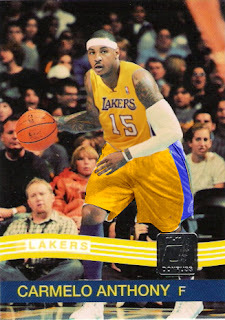 Recently my thoughts have been centered around non-sports cards. I figured if I wrote something up maybe I can clear my mind and move on. 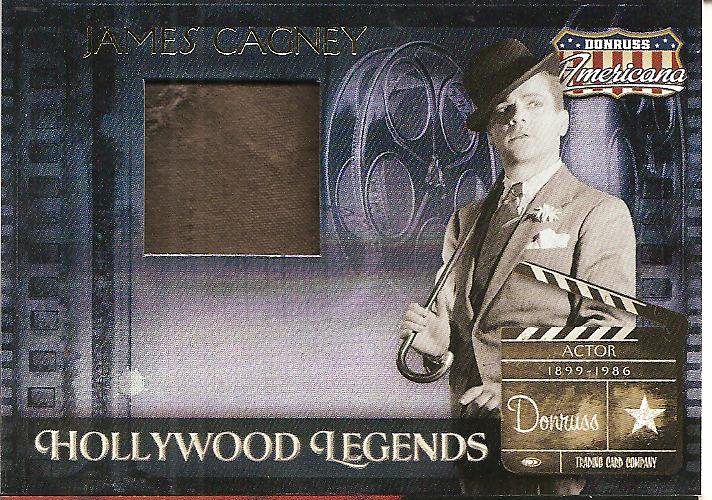 The George Burns coat relic and the James Cagney coat relic are probablty my favorite two pulls. 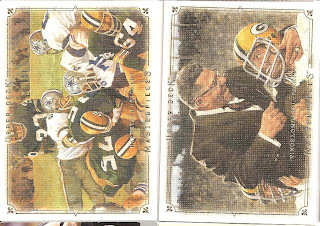 I am a fan of non-sports card, not in all cases and not when used as inserts in sports sets but in many cases a non-sports set can be interesting. Non-sports sets have been around since even before baseball cards. Interested? Do a search and you will find sets like the 1880 N150 Gail & Ax Actor/Actresses set, the 1886 N16 Native American set or the 1887 N3 Allen & Ginters Arms of All Nations set. These cards are amazing considering the time period, people did not travel much and these cards allowed someone to get a look at something “unusual” to them. One of my favorite sets of all time is the 1938 Horrors of War series, an awesomely illustrated set created by Gum, Inc., that showed the literal horrors of war focusing on the invasion of China, the Spanish Civil War, Germany and Italy in the prelude of World War II. Some of these cards, specifically the ones related to Hitler, can demand hundreds and sometimes thousands of dollars. I am a fan of the show Spartacus on Starz. If you have not seen the show it is loosely based on the true story of Spartacus, a Thracian who was taken prisoner by the Romans and sold in to slavery where he was trained as a gladiator and then led a slave revolt around 73 BC. When I found out that Rittenhouse Archives will be releasing a set based on the first season, Spartacus: Blood and Sand, I was excited. But the price floored me. We are talking a whopping $750/box! You read that correctly, not $75 but $750! Each box, if collated correctly, should give you 2 complete autograph sets, and a complete set of the Episode Synopsis, Savage and Seductive sets plus an additional 22 cards from the 4 different insert sets. That is IF each box is collated correctly, if not I can see some very upset customers. They only list 10 actors on the checklist on their web site so I wonder who the other 2 autographs may be. Hopefully one of them is Peter Mensah, who played Doctore, a major character in the first season. I wouldn’t mind seeing either Craig Walsh Wrightson, who plays Solonius, or Antonio Te Maioha, who plays Barca. I understand you are getting 30 autographs, but there is only 12 actors on the checklist so you will be seeing at least 2 if not 3 of each person. The other inserts are just that, insert sets. Even with low numbering that doesn’t account for the cost of the product. 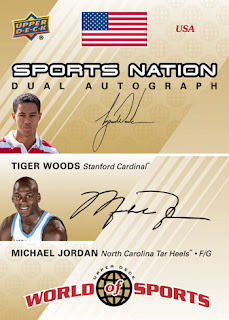 You can probably argue that there will only be 200 boxes made but if the boxes are collated correctly there will still be at least 400 autos of each person which is nothing compared to the 1/1 autos that you find in many sports releases. I will be looking to picking up individuals of the Savage cards and I wouldn’t mind finding an Andy Whitfield or the very beautiful Viva Bianca autograph for a reasonable price. In a final note I wish Andy Whitfield the best of luck in his battle with cancer, all of his fans are supporting him during this difficult time.